The Epic of Gilgamesh (Sha naqba īmuru) was written on 12 clay tablets in cuneiform script. It is about the adventures of the historical King of Uruk (somewhere between 2750 and 2500 BCE). This later 12-tablet verse version was found in the library of the 7th-century BCE Assyrian King Ashurbanipal. The Flood Tablet, the eleventh tablet of the Epic, describes the meeting of Gilgamesh with Utnapishtim (British Museum). The best known of these was the story of Gilgamesh, a legendary ruler of Uruk, and his search for immortality. The Epic of Gilgamesh is a huge work, the longest piece of literature in Akkadian (the language of Babylonia and Assyria). It was known across the ancient Near East, with versions also found at Hattusas (capital of the Hittites), Emar in Syria and Megiddo in the Levant. 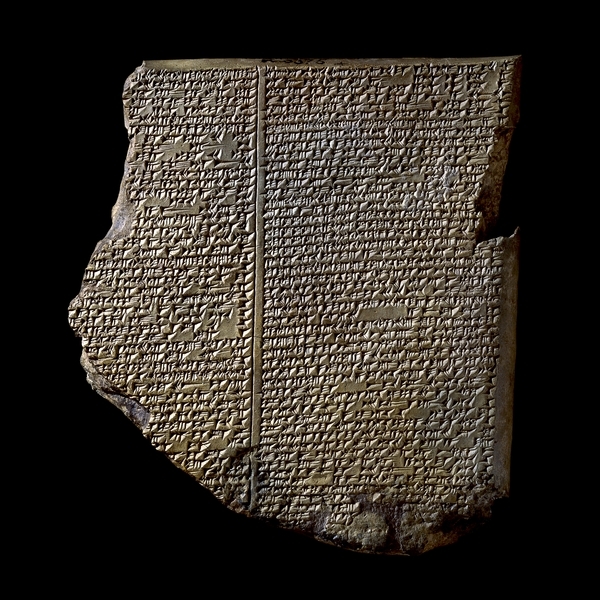 This, the eleventh tablet of the Epic (pictured above), describes the meeting of Gilgamesh with Utnapishtim. Like Noah in the Hebrew Bible, Utnapishtim had been forewarned of a plan by the gods to send a great flood. He built a boat and loaded it with all his precious possessions, his kith and kin, domesticated and wild animals and skilled craftsmen of every kind. This entry was posted in Ancient Texts and tagged Epic of Gilgamesh, Noah, Sumer, Utnapishtim, Ziusudra on January 31, 2015 by ZSI.